Since 1991 Specializzata provides a 360° answer to the call for information and education of construction businesses., with particular interest in the field of restoration, refurbishment and renovation. In fact the blooming of this unexplored trend, as opposed to the extensive building of new housing in the 70s and 80s, provided an opportunity for the birth of new specialized construction firms in need of updates on the fast evolution of products and techniques available in the market. 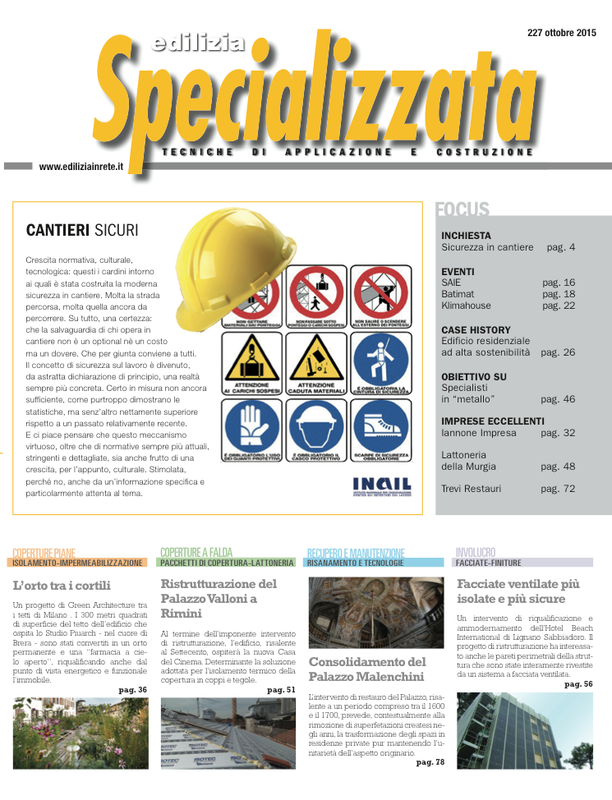 Specializzata offers its extensive know-how and innovative outlook in the field, thanks to its highly qualified content. In order to aptly respond to the specialized needs of its target audience the content is organized along a thematic approach: flat roofs, pitched roofs, building envelopes, internal partitions, renovation and maintenance, systems, sustainability, cladding, news and regulation. By-monthly, 6 issues per year. Circulation (paper and digital edition): 8000 copies.